GETTING charged by an elephant bull while learning to drive in the Kruger National Park is a moment Nicola Gerrard will never forget. Nor will her father, John Bishop, the well-known sports writer. “My Dad was thinking: ‘Oh my god, we’re gonna die!’,” recalls Gerrard. In the driver’s seat of the family’s Toyota Venture, Nicola, then still a teen, battled to get the car into reverse. Once she did, it raced off backwards. The bull quit its chase, turning its attention to other approaching vehicles. Gerrard guesses the bull had to have been in musth – a period in a bull’s life when testosterone levels can be up to six times the normal level. As an avid outdoor adventurer, Gerrard, now 33, has had her fair share of brushes with big fauna, including crashing into a buffalo crossing a highway and swimming beside hippos while trying to fix water lines in the Okavango Delta in Botswana. Then there was a more recent incident, also in the Okavango, when she stalled a boat and nearly bumped into a swimming elephant – but unlike a bull on musth, this old pachyderm was friendly. “I know it sounds ridiculous, but he was an old bull. We saw a lot of him in the area. It was almost like he knew I had made a mistake,” laughs Gerrard. These vivid memories are closely intertwined with a host of others related to Gerrard’s love of diverse landscapes, people and wildlife – and for her late sister, Kim, who inspired the work that Gerrard does today. Gerrard is the founding managing director of loveAfrica Marketing, which aims to create awareness about key environmental issues and wildlife crime, and to get people to act for the better of the planet. Gerrard grew up in Pietermaritzburg, KZN. After matriculating from The Wykeham Collegiate, she took a gap year and went off to the bush. 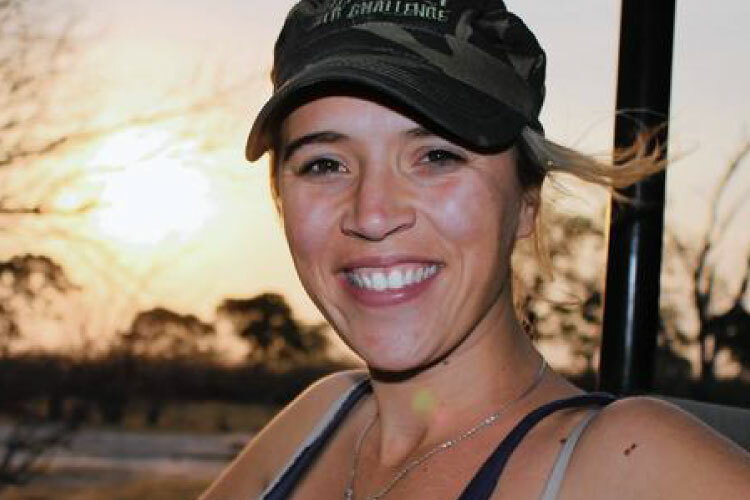 She worked as a reception manager at Mala Mala Game Reserve, in Sabi Sands, where she met her husband, Mark Gerrard, then working as a game guide. After completing an honours degree in marketing and communications at UKZN, Gerrard’s tourism and lodge experience continued to grow. She worked at five-star lodges in Singita, South Africa, and in the Okavango, where she and Mark were general managers with AndBeyond, a luxury travel company. They then moved to Durban – the couple now lives in Kloof – and e-worked for a lodge in Lesotho, handling its marketing and other operations online. Then, on March 19, 2012, Kim died in a car crash. She was 25 years old. “The ground just comes up from underneath you,” recalls Gerrard. Kim was a teacher who “used to make incredible changes to young minds”, says Gerrard, and Kim’s death had a profound impact on Gerrard’s vision for her own life. “She inspired in me to work in what you love and to create change. I saw there were incredible people doing incredible things, but without the tools or know-how to talk about it. I gained this unbelievable perspective and went from general tourism and travel marketing to working on projects that really matter,” she says. That’s how loveAfrica Marketing began in 2013 – and it has already made a change, working on a number of top environmental initiatives in South Africa. These include Only This Much – a project by WildOceans to raise awareness that only 0.4% of South Africa’s oceans are protected – and the documentary exposé, Blood Lions, which sparked international outrage over canned lion hunting. “There are about 9 000 lions in captivity in facilities across South Africa,” says Gerrard. “These form part of the canned hunting, predator breeding, cub petting and lion bone industries. Some are knowingly supported by paying tourists and volunteers. The Blood Lions campaign shines a light on this dark industry and creates awareness across the globe,” says Gerrard. “Awareness is the key and through understanding and education, change is possible,” says Gerrard, who has also worked with Wildlife Act and Project Rhino in monitoring threatened species, including wild dogs, and on rhino darting operations that concern relocations and tracking. “This work requires constant and consistent messaging. We need conservationists to work together with a common vision and for the public to understand the impact that our way of life has on the planet and on other people around them,” says Gerrard. She singles out her role as digital marketing manager of Blood Lions as the highlight of her career to date. So far, the documentary has been viewed by several hundred thousand people in more than 180 countries, and the Blood Lions campaign has reached millions of people, says Gerrard. The standing ovation that it received at its official premiere at the Durban International Film Festival in 2015 still makes Gerrard’s blood tingle – almost as much it did on the day she battled to get her family’s Toyota Ventura into reverse in the face of a charging elephant on musth.